Tightwad: Tightwad book giveaway for September! Tightwad book giveaway for September! It's here! Tightwad's book giveaway for September. Woot woot! 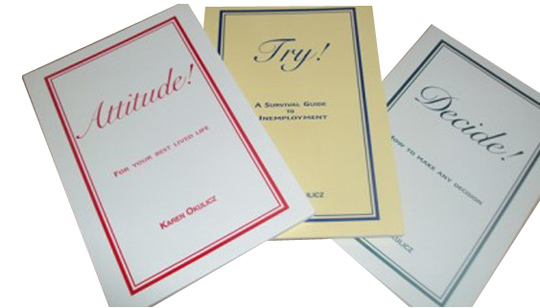 Karen Okulicz is the author of three motivational pocket books. Try: A Survival Guide to Unemployment; Decide: How to Make Any Decision; and Attitude: For Your Best Lived Life - receive all three! Each book captures the best successful personal responses to job loss, decision making and keeping a positive attitude. Written in stream-of-conscious style with lots of short snappy sentences, quips and phrases, Ms. Okulicz imparts her wisdom and shares ideas and suggestions for successfully navigating the world of work and thriving there. The first two books were written in response to Ms. Okulicz successfully traversing the world of unemployment (twice in three years), and becoming recognized by her friends as the go-to person with job search wisdom and insight. She eventually parlayed her experiences into a motivational speaking career, writing the books in response to friends' urging then providing workshops on them. Her books are utilized resources by State and Federal Agencies, College Career Centers, Outplacement firms, Job Corps and in Military RIFs and Spousal Support programs across the US. Ms. Okulicz hosted and produced the radio show "Workline". She conducts lectures and workshops throughout the country. I would recommend reading the books written by Karen Okulicz for anyone that needs a little motivation. These books will encourage you NOT to give up, to believe in yourself, to decide what the best option is for you and how to keep the best attitude about yourself and your life. Would love to share these with my daughters.. don't tweet ,,,sorry am I still entered!!? ?